The 4x400 breaks the school record for the 2nd time this season en route to an 11th Place finish in the National Championship 4x400! This is the Fastest 4x400 ever run on a regulation 200 meter track and #2 overall! Kenneth Dias (50.8 PR), Hudson Scanni (51.2 PR), Steven Anzalone (50.8) & Jason Marchese (50.2 PR) run personal bests. The 3:23.15 FAT is the 12th Fastest in CHSAA History! Many thanks to the Scanni family for donating the singlets for Nationals. 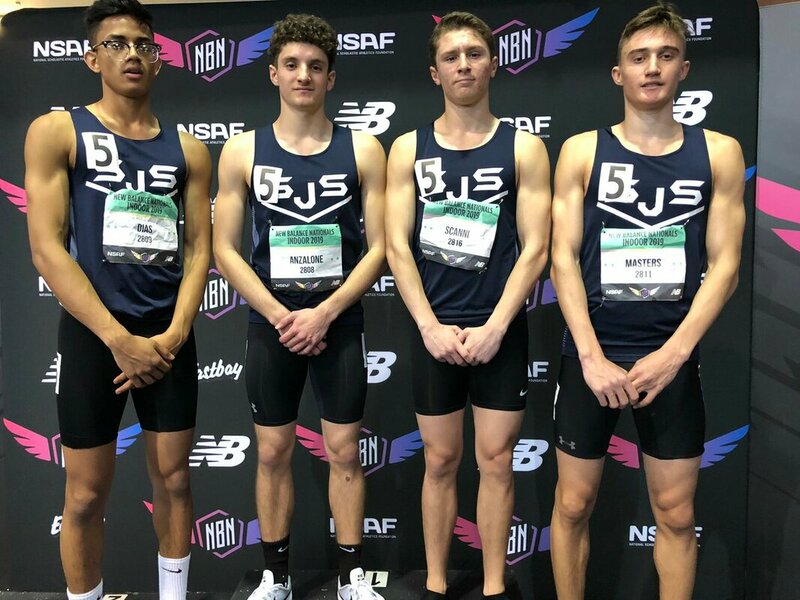 On Friday, the 4x200 ran 1:32.98 FAT with Vin Siracusa (23.7), Hudson Scanni (22.6), Kenneth Dias (23.3) & Jason Marchese (23.1) handling the duties. GEORGE T. EASTMENT 4x800 CHAMPIONS! Historic day for the Vikings at Ocean Breeze! 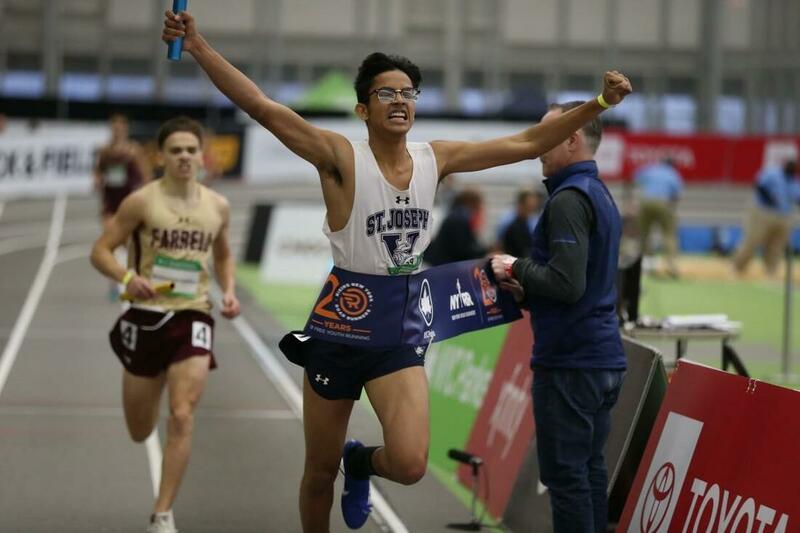 Running in the George T. Eastment CHSAA 4x800, a race rich in tradition that has been run at Madison Square Garden, the Armory and now Ocean Breeze; after a near miss 3 years ago; finally win the race! Dom Palermo led off right in the mix, a few meters off of the lead with a 2:02.4 carry. Corey Pisapia, ran his best race of the indoor season thus far and took the lead before handing off just off the pace with a 2:02.4 leg as well. Steven Anzalone shadowed Msgr. Farrell for almost his entire leg while handing off in a 1:59.3. Ken Dias, a sprinter running in his second ever 800 and replacing our top 800 meter runner who was injured ran the race like a true veteran. 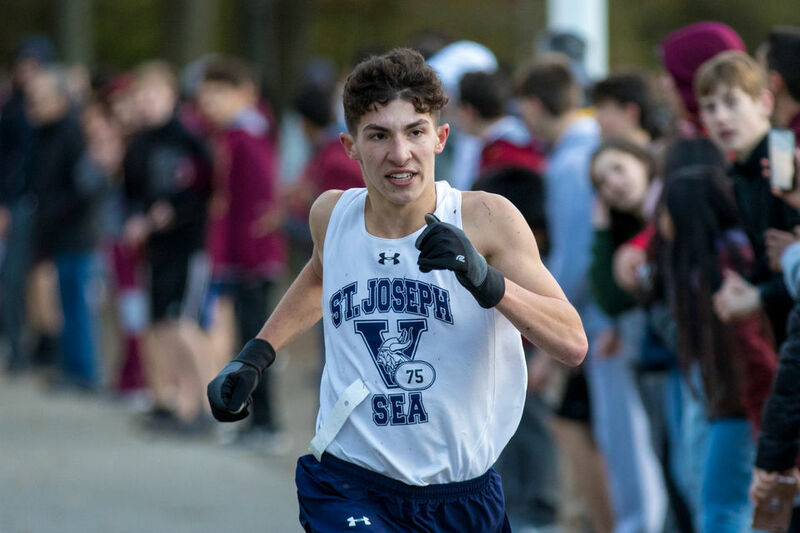 After taking the lead briefly after 400 meters, he tucked behind a Farrell runner biding his time and with 150 meters left in the race unleashed a huge kick that got the crowd to rise to its feet. The result was a 2:02.1 PR but more importantly a first place finish for the Vikings in a race that has eluded us. The league presented the relay with commemorative fleece jackets for winning the 75th edition of the race. 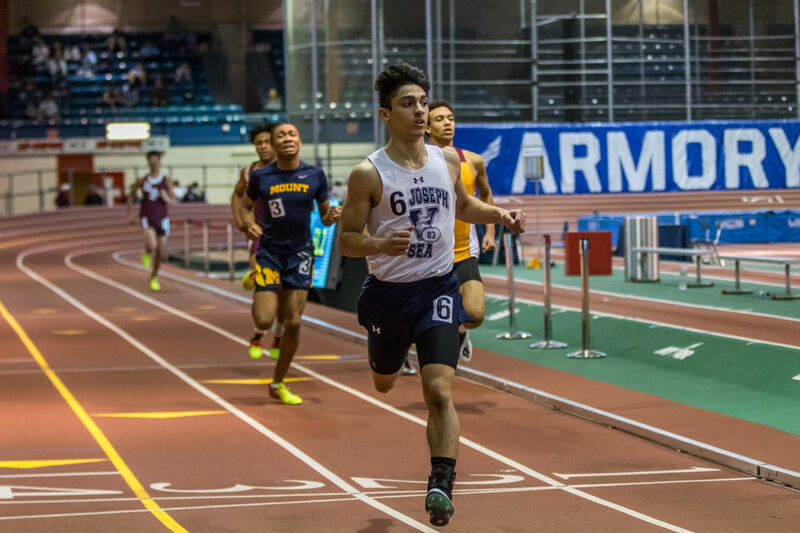 Earlier in the day, the 4x200, running without Dias led from start to finish to win the Jim Hughes Staten Island 4x200 in a meet record time of 1:32.49 FAT. Vincent Siracusa, Hudson Scanni, Jason Marchese and Nick Patinella comprised the relay. 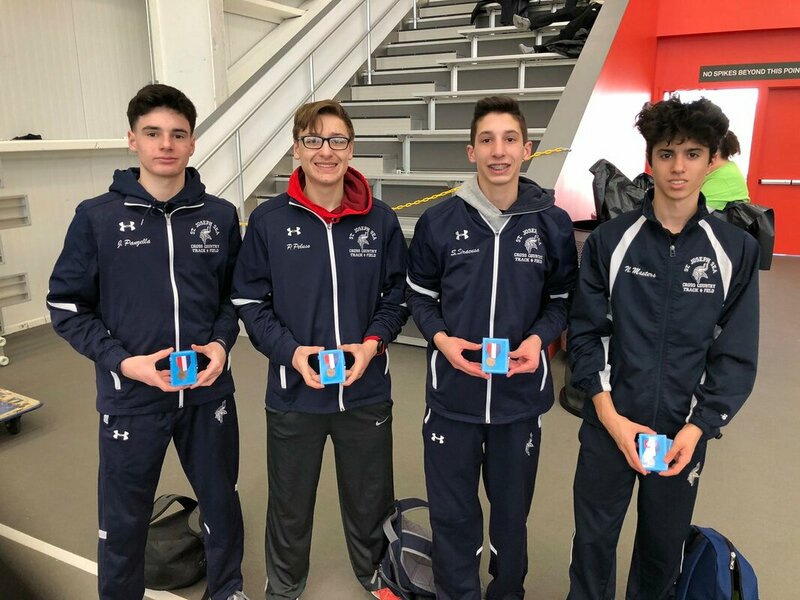 Representing Staten Island's first qualifying relay in the CHSAA Donal Buckley 4x200, the relay takes 3rd place plaques in a seasonal best and school record 1:32.01 FAT. This is #2 ALL-TIME in Staten Island history. Kenneth Dias (23.0), Hudson Scanni (22.3), Jason Marchese (23.4), Steven Anzalone (23.2) comprised the relay. Dom Palermo sets a PR in the mile with a 4:36.92 FAT. Vin Siracusa has a nice day in the sprints with a 52.98 PR in the 400 and a PR for an open 200 in 23.41 FAT. In the 800, sprinter Ken Dias runs a fine 2:02.70 FAT to lead the team. FIRST RELAY GOLD IN 4x8 AT CATHOLIC STATES! The Varsity SMR gets a special invitation to the New Balance Grand Prix at the Reggie Lewis Center in Boston, MA. Varsity 4x4 Smashes the School Record by 5 seconds in New Balance Win! 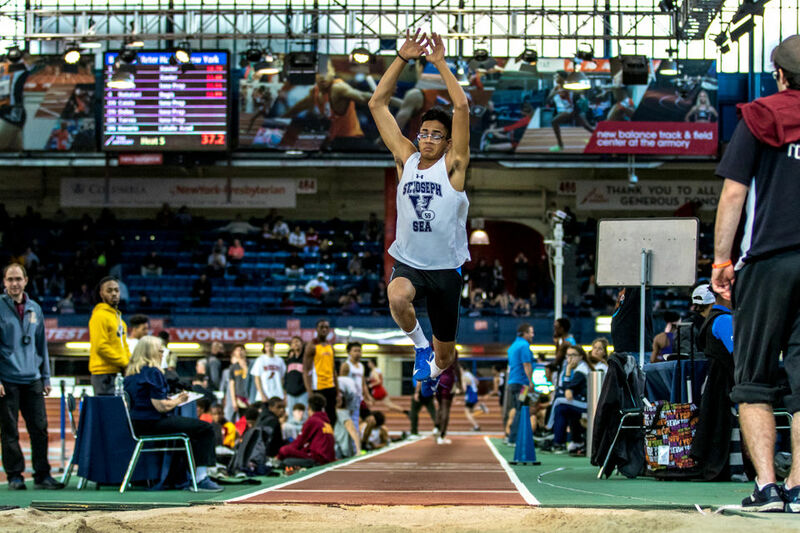 Vincent Masters wins the NY Sectional title in the 600 meter run and 2nd in New York City. 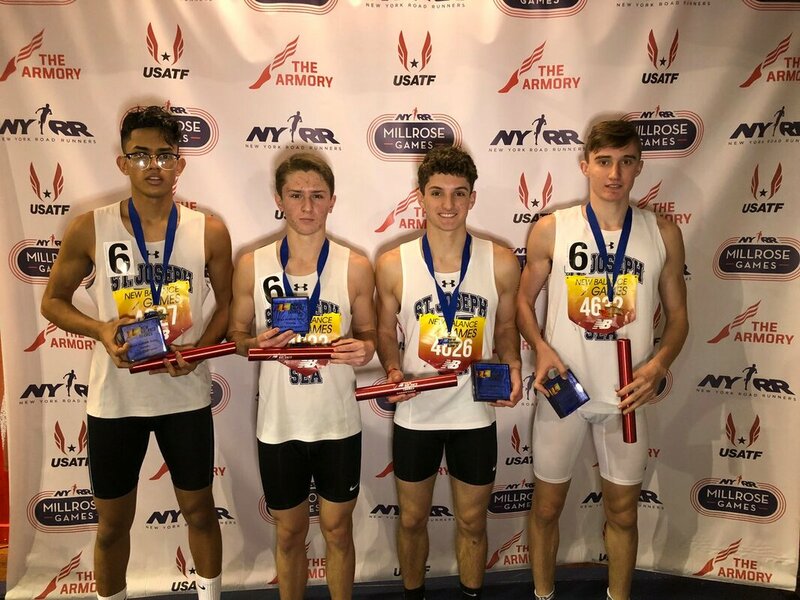 The Soph 4x800 takes 2nd in the NY Sectionals and 2nd in New York City. Six out of six 300 runners leave Ocean Breeze with PR's. In the SMR Showdown, Rob Nebel anchors the "B" squad to a big win and the relay takes 5th place overall. Rob Romeo and Billy Voigt run personals bests in the Varsity 600 meters. A small, yet determined and tough 30 man squad scores 93 points en route to a second place finish. Jason Marchese gets the day started off with an upset 8.50 FAT win in a huge personal best in the 55 meter high hurdles. Dom Palermo runs a gutsy, 17 second PR in the 3200 for 4th place with a time of 9:59.32 FAT.Ken Dias runs a big PR to win the 300 meters with a dip at the finish line in 36.07 FAT. Scanni, after taking 4th in the 55 meters would take 3rd in the 300 in a PR of 36.30 FAT. Steve Anzalone runs a solo effort to win the 600 meter S.I. Championship in an uncontested 1:24.68 FAT. Corey Pisapia, running in the 2nd section, comes up with a BIG 2nd overall place in a PR of 1:26.89 FAT. The Varsity 4x800 and 4x200 take 2nd place. 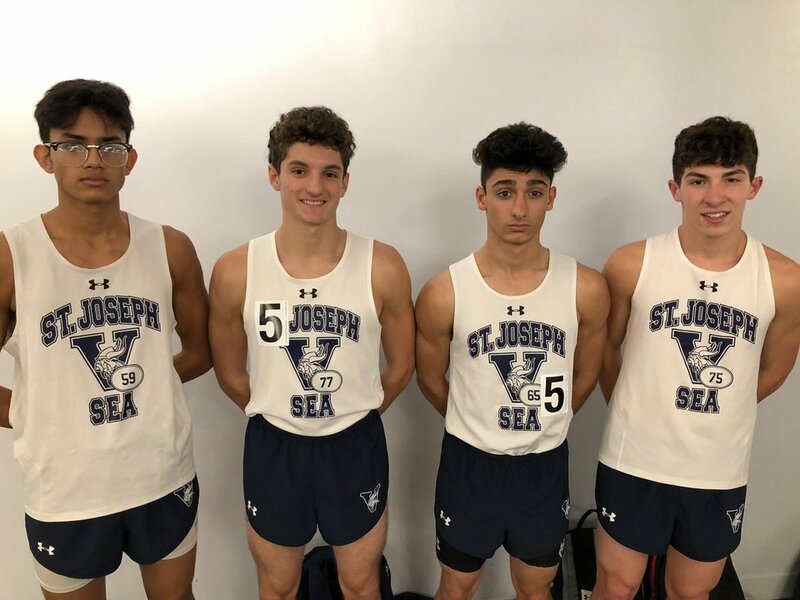 The Varsity 4x400 of Anzalone, Pisapia, Billy Voigt and Vincent Siracusa win the Staten Island Championship. The "B" team run incredible and 4/4 PR en route to a nice 6th place finish. Dias, earlier in the day, would take 2nd in the triple jump in a PR of 42'-7.5". Big Matt Dybas took 4th in the shot put with a toss of 37'-.25"
​ HISTORY AT THE USATF TIME TRIALS! 4x2 Is First Island Squad To Qualify For The Buckley Race! 4x8 Qualifies An Island-Leading 13th Time! HISTORY! 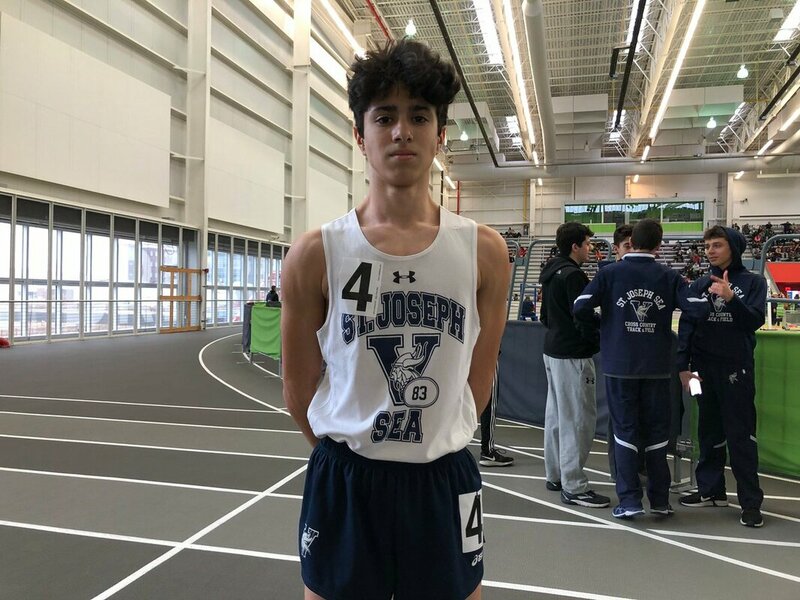 Sea makes history by not only qualifying the Island's first 4x200 for the Don Buckley CHSAA 4x200 BUT by also having a 4x800 at the same finals. 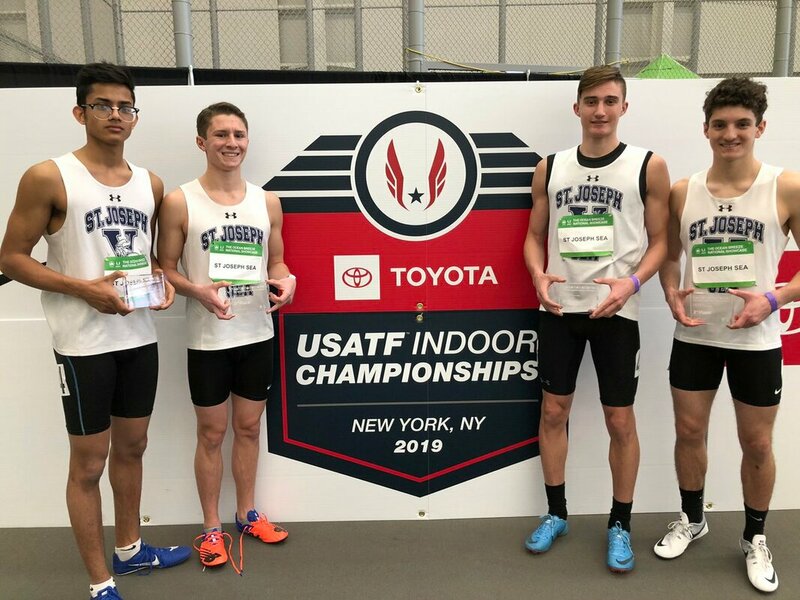 BOTH relays qualify for the USATF Championships in late February (The Millrose Games are the same day as the CHSAA Intersectionals) Things got off to a fast start with many PR's by the 4x200 relays especially with Nick Patinella (24.4) and Stephen Siracusa (24.5) setting big PR's. In the 9th and final heat, our 4x200 needed to break 1:34 to secure a Top 6 qualifying position. Ken Dias led-off in a 23.2 and handed to Jason Marchese who ran a PR of 23.0. Vincent Siracusa ran a great leg and a PR of 23.1 before handing to Hudson Scanni who anchored it home in a 22.9. The time of 1:32.50 FAT was 3rd in the trials and crushes the former school record from 2015 (1:33.32). 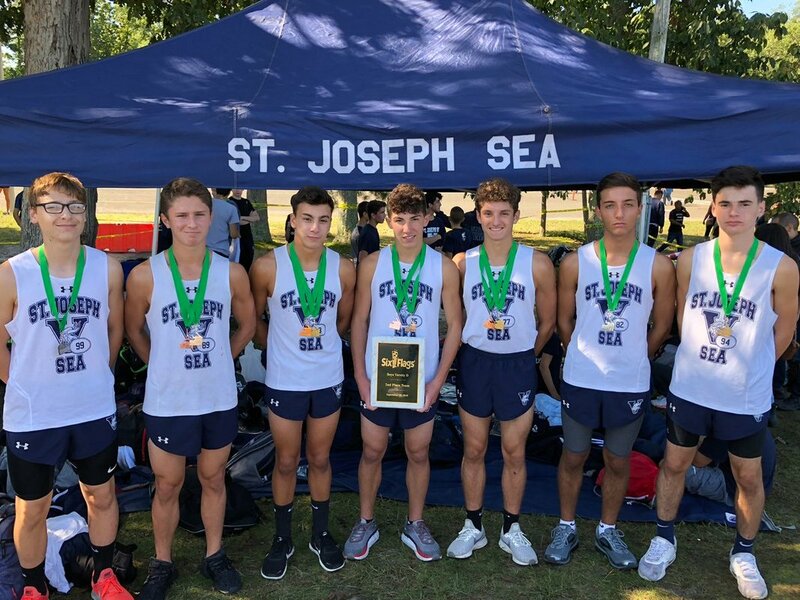 It is the SIXTH Fastest in Staten Island history! They are currently ranked#15 in NY State. In the 4x800, the team races to a second place finish in a seasonal best time of 8:09.93 FAT. 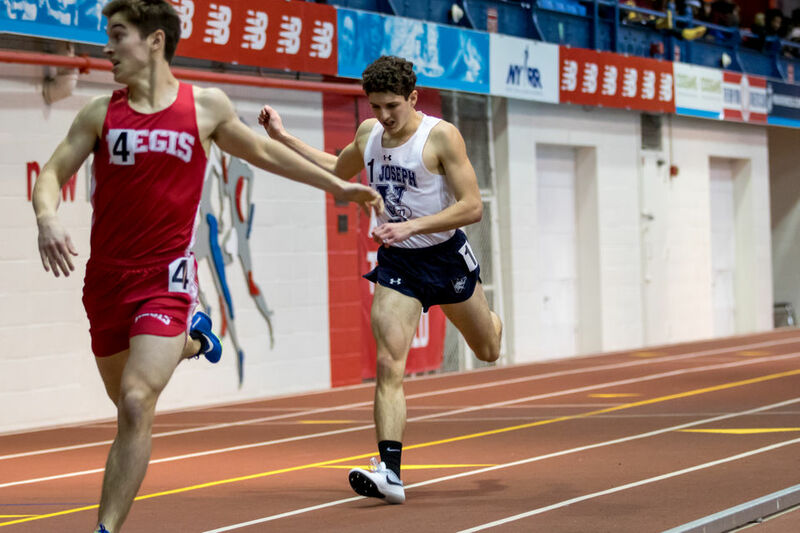 Dom Palermo led off handing off in 8th place and gave it to Steve Anzalone who ran a spectacular leg breaking two minutes for the first time this indoor season while moving the relay up to 2nd place. Corey Pisapia held steady before Nick Masters moved the team into its final 2nd place slot on a 1:58.7 carry. They are currently #3 NY State and #9 USA. This is Sea's Island-leading 13th time qualifying for the George T. Eastment final! The Varsity SMR cruises to victory in a 3:36.88 FAT. The time is the 6th FASTEST IN SI HISTORY and currently #1 NYS, #2 USA. They have now qualified for the Championship section of the New Balance Nationals and its only December! 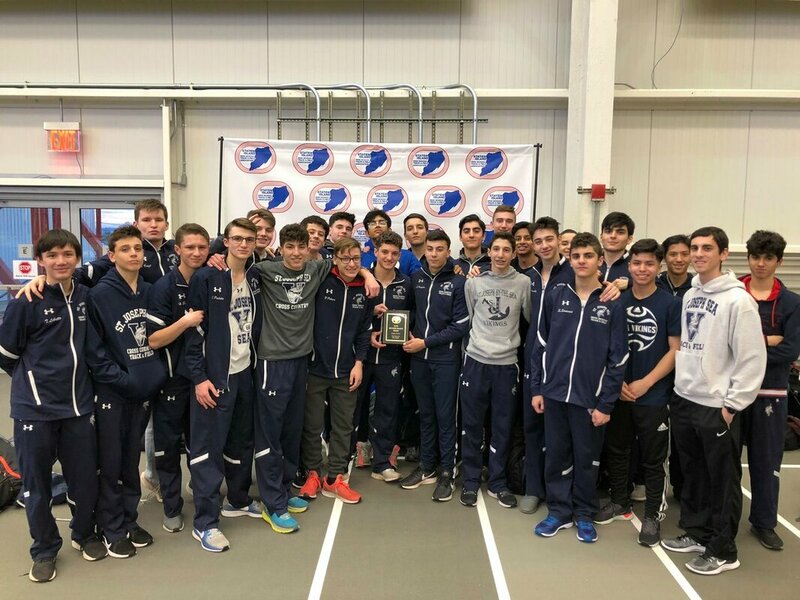 The Vikings end 2018, ranked #1 in the 4x800, #2 in the 4x400 and #4 in the 4x200 in the CHSAA as well as numerous state and national rankings and....the best is yet to come! A fun, team binding trip during the Christmas break leads to many medals and PR's. Nick Masters lights the track up with a 1:22.28 FAT in the 600 meters for 2nd place. His time broke the school record, is the 6th fastest in S.I. History and is currently #1 in NYS and #4 in the USA! The Varsity 4x200 relay take 6th place medals on a nice anchor leg by Hudson Scanni, running in his first meet in close to a month. The Varsity 4x800 runs a very nice relay as 3/4 guys PR. To end the day, the Varsity 4x400, running on tired legs, takes second place in a seasonal best time of 3:29.43 FAT. A great day to get many guys a workout. Lots of potential for later in the season. The 4x200 makes the final on doubles for many athletes. Ken Dias jumps 41-4 and takes 3rd place. The Varsity 4x200 and Varsity 4x800 take first place amongst the CHSAA teams at the Relay Carnival. The Varsity 4x200, still running without leadoff man Hudson Scanni, wins out of the 2nd heat with a time of 1:34.70 FAT. The relay is currently in the top 10 in NY State. The Varsity 4x800 nearly led wire to wire en route to a 8:14.53 FAT which should secure a slot in the seeded section of the USATF Time Trials. The relay is currently #2 in the USA!! The weightmen lock down sets of medals in all weight 4x200 relays and the Soph 4x800 take 4th place bronze medals. The Varsity SMR, in the final event of the day, strikes gold to close it out. Joe Pecoraro places 19th with a 9:34 and Jason Mainolfi takes 34th with a big PR of 11:07, -1 min, 34 seconds. Dom Palermo becomes the 20th Viking to ever break the 14 minute barrier. His 13:56 is currently #25 ALL-TIME. The Varsity team takes 4th in the NY Archdiocese and #5 in NYC. Robert Nebel throws down a HUGE PR in the JV race with a 16:13, good for a best by almost 2 minutes. Capt. 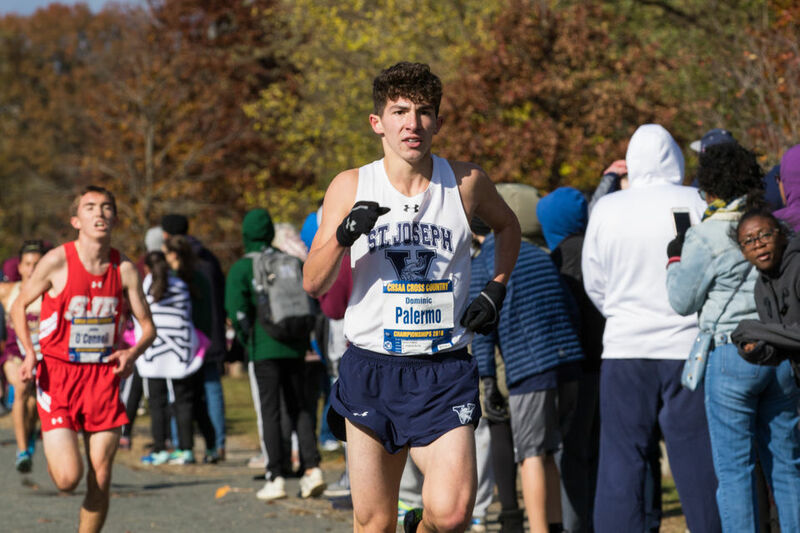 Dom Palermo just misses breaking the 14 minute barrier with a 14:00.2. The Varsity drops their seasonal 5 man average from 14:49 to 14:27 with 5/6 setting PR's. Soph Vin Masters breaks 15 minutes decisively with a 14:49. Sophs Phil Peluso and Anthony Palermo pace the JV with huge PR's of 15:14 and 15:19, respectively. Billy Voigt sets a 35 second PR with a 15:36. 14/15 JV runners set PR's and many of them big. Sophs take 5th place in a hot, hazy VCP. Dom Palermo leads the varsity squad to a 2nd place finish. Vincent Masters takes 2nd in his return to racing. Colin Hunt runs a big race for 7th place overall. The varsity team finishes in 16th out of 107 teams in the merged results. XC '18 gets off under rainy skies at Clove Lakes Park. This year,and next year at Clove, the SIHST&FA will be running a temporary 3 mile course for the Varsity/JV as construction on the trails take place. Hudson Scanni leads the Varsity to a 3rd place finish! A strong punch by the JV team of Phil Peluso-Anthony Palermo-Vin Siracusa push the team to a 2nd place team finish. Some fine JV times were recorded as well! 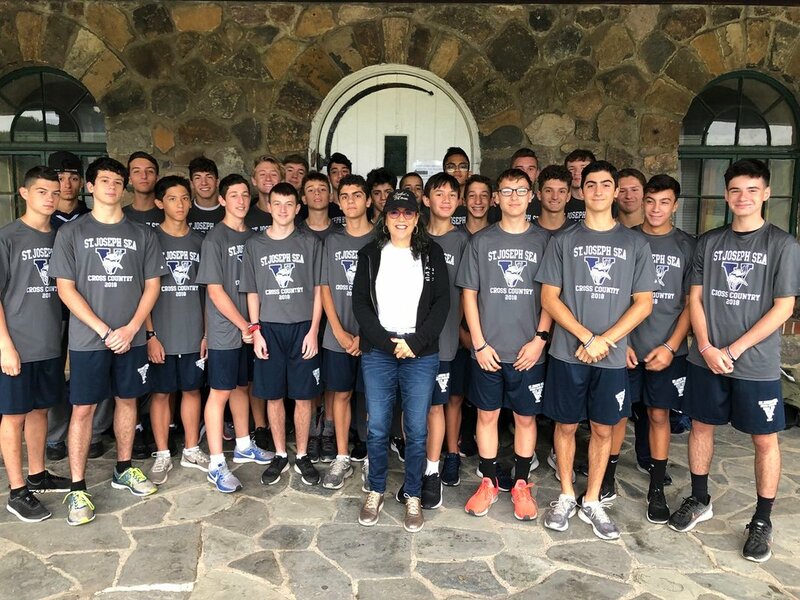 CROSS COUNTRY 2018 AT INSPIRATION RUNNING CAMP!